See You in Hancock County! | See You in Hancock County! 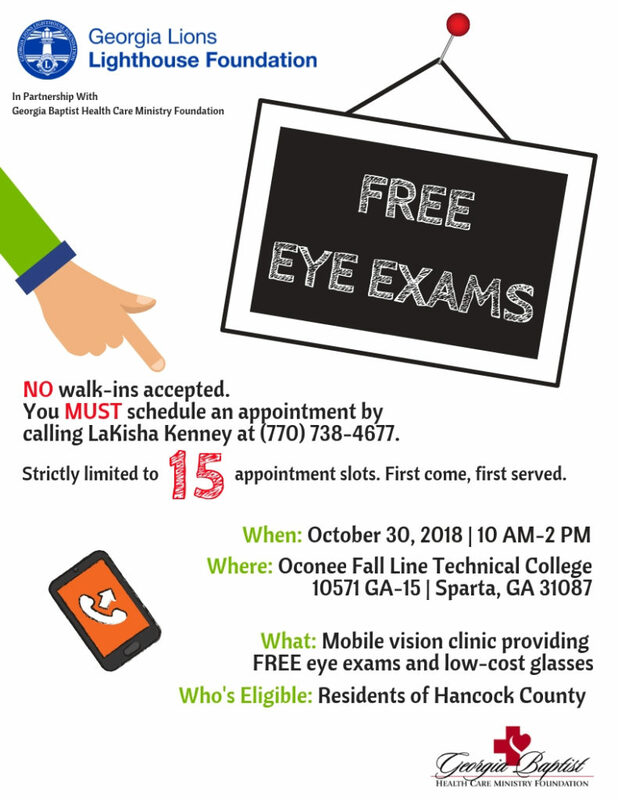 Upcoming FREE Eye Clinic: 10/30 in Hancock Co. The Lighthouse vision team will be in Sparta, Ga., on Tuesday, Oct. 30, for our next Georgia Baptist Health Care Ministry Foundation-sponsored clinic. As you may remember from earlier posts, GBHCMF has very generously provided the funding for The Lighthouse to visit – for the first time – many of the state’s most rural and under-served areas. Are you in or near Hancock County? Need an eye exam? Check out the flyer! We’ll be at the Oconee Fall Line Technical College at 10571 GA-15 in Sparta on 10/30 and are looking forward to serving Hancock County!! Appointments are limited, so please call LaKisha Kenney at (770) 738-4677 to schedule yours before they fill up! See You in Hancock County!